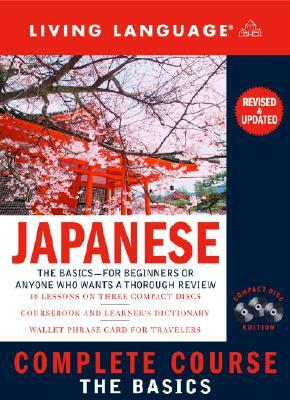 The top-selling "Complete" series has been fully revised, with all new supplemental material and a bonus wallet phrase card for travelers. Each program contains everything a beginner needs--a coursebook with 40 lessons, three hours of recordings on three CDs, a quick-reference learner's dictionary, and an all-new indispensable wallet phrase card, all in a convenient and compact package. The courses still use the popular and effective conversation building-block method, but all content has been thoroughly updated and now includes e-mail essentials and internet resources for each of the eight languages in the series. In addition, 18 supplemental vocabulary sections, covering such topics as "Family and Relationships," "On the Job," "Sports and Recreation," and "Around Town," are now included. As an added bonus, the new handy wallet phrase card with 300 essential words and phrases is the perfect reference for on-the-go learners, travelers, and businesspeople. Description: Three CD set with two books in case. CDs guaranteed to be in good working order. Books are clean and unmarked ( no underlining etc. ) and in excellent condition.